What’s Christmas morning like at your house? Have you noticed that, ironically, Christmas Day is one of the easiest times to forget about Jesus himself? My husband and I noticed this Christmas Day phenomenon when our kids were little and decided to start a fun Christmas morning tradition. 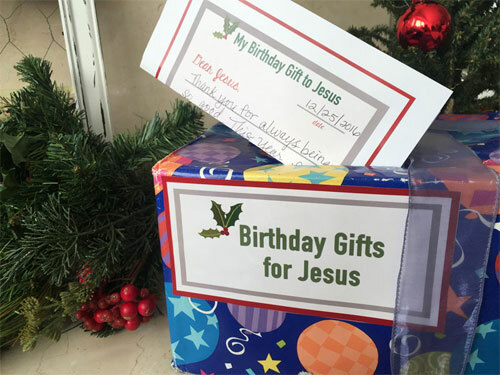 In order to keep Christ the focus on Christmas morning (and truly say Happy Birthday to Jesus), we started the Christmas tradition of the Happy Birthday Jesus Gift. This simple Christmas morning tradition is something any family can do! Let me show you how to bring this Happy Birthday Jesus tradition to your family’s Christmas traditions too. It’s actually pretty simple. Before we open any gifts, we spend time as a family praying and reflecting on the miracle of Christ’s birth. Then we take 5-10 minutes and write him a simple note–a gift of our heart. Here’s a video from the Your Vibrant Family You Tube Channel that explains more. I always think of the little drummer boy when we do this! Really, what else can we give him but the gift of a life surrendered to His will? A heart eager and ready to follow Him? A mind that desires to grow deeper in His wisdom? Some years I have confessed an ongoing fear or sin that I’ve struggled with and chosen to give this up to Him as my Christmas gift. He loves when we desire to say goodbye to our old ways so that we can embrace His better ones. These notes are priceless and truly the highlight of our family’s holiday season. After weeks of studying scripture and hearing the Christmas story (and doing Acts of Kindness), this is the moment where we officially get to apply all the teaching and activity. This is when we get to say: How will this year’s Christmas season change me from here on out? And did you catch that my family and I have been adding our “gifts” to this box for 16 years now?! Wouldn’t you love to start that tradition in your family too? How amazing to have years (or perhaps decades!) worth of Christmas notes to God from all your family members! I’ve made it super easy for you and your family to enjoy this incredible time of reflection and application on Christmas morning. 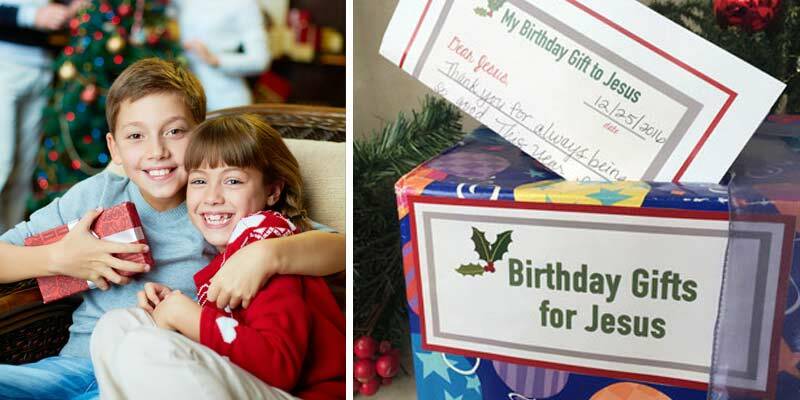 You can get a colorful Christmas-themed “Letter to Jesus” sheet plus the labels to make your own Christmas Gift for Jesus box! They’re one tiny part of the incredible Christ-Centered Christmas Family Traditions System Printables! It’s all figured out for you! No spending hours scrolling the internet for something that might work (we all have loads of extra time at Christmas, don’t we?!). Just print and go! I know that you’ll love doing this Birthday Gift for Jesus activity with your family… along with the other parts in this incredible system! Make this the year that your family experiences and lives out the truths of the Christmas season through the activities and experiences found in the Christ-Centered Christmas Family Traditions System! And don’t forget to learn more about the “Birthday Gifts for Jesus” and the rest of the awesome resources in this system here!